Why should I treat my cats for parasites? 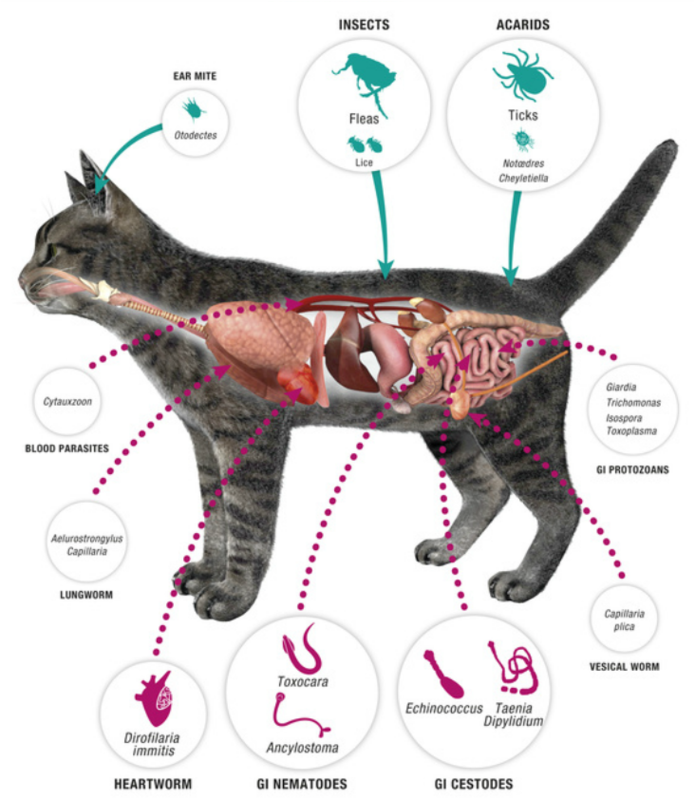 The presence of fleas, ticks and worms in cats causes disease in cats but can also be a risk for humans, especially children. Young children are particularly at risk of contracting worms as they do not wash their hands and often put things in their mouth. Toxocariasis (caused by roundworm) is particularly dangerous as the worms can migrate into organs such as the eyes (causing blindness) and sometimes other major organs like the brain, heart, liver and lungs. How often should I treat for parasites? Cats can pick up fleas, ticks and worms throughout the year, becoming re-infested whenever they are exposed to a contaminated environment. Your cat’s risk of exposure depends on his/her lifestyle, the time of year and the presence of other cats. The information you provide me in my "Getting To Know Your Cat Questionnaire" helps me to advise you on the right level of cover for you and your cat(s). Together we can create a parasite control schedule that is as individual as you and your cat’s lifestyle and the risk of different parasites. It’s really important to remember that it’s not enough just to treat cats once against parasites, they need regular protection throughout the year. From time to time cats encounter other parasites, particularly those who may have travelled overseas or come from environments where cats have been housed win large numbers. These products are intended for the treatment of fleas and ticks on dogs only. They contain permethrin, a substance that is safe for dogs but causes a toxic reaction in cats when present in spot-on products, due to its concentration. Cats treated with even small amounts of spot-on products containing permethrin, or allowed to groom dogs treated with any of the products in the list above, can develop nervous signs such as depression, drooling, tremors, seizures, vomiting and staggering, and may die. Some pet owners apply spot-on products containing permethrin that are indicated for use in dogs to their cats by mistake, or because they think that it is safe if they use only small amounts of the product. It is not safe to use any spot-on product containing permethrin in cats. If you have applied any of the products listed above to your cat, it is important to wash off the product from the cat with water and a mild detergent and seek immediate treatment from your veterinary surgeon. Take the product package with you and show it to the vet. The VMD (Veterinary Medicines Directorate) is actively monitoring the incidence of suspected adverse reactions to these products and requests that any incident be reported as soon as possible. Details of how to report a suspected adverse reaction can be found here. NB: The dilute concentration of permethrin in some environmental sprays is acceptable but only when used strictly to the packaging's recommendations (eg cats prevented from exposure to the product until the product has dried). Again always check that the house spray you are using is designed for use around cats.